This custom-made handset is manufactured by Vietnamese brand Karalux and international customers will be able to get it for roughly $1,350 USD starting December 5th. BlackBerry Priv is one of those handsets that stands out of the crowd and looks at least good, if not great. After all, beauty is in the eye of the beholder. 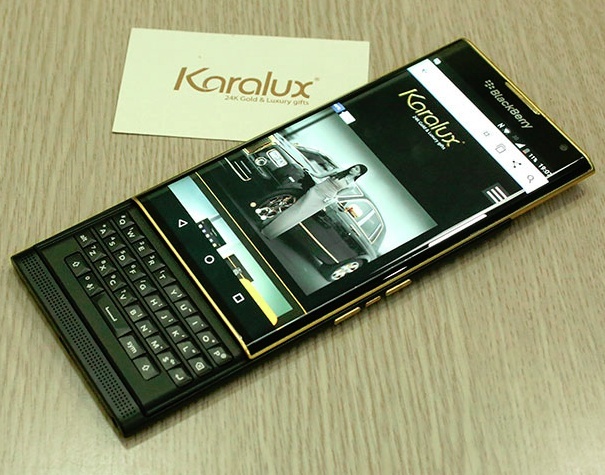 Those looking for a gold-plated Priv will finally be able to get one starting this weekend when Vietnamese gold-plating Karalux launches its golden BlackBerry Priv. Karalux is not new to this market, as it already dressed in gold the Samsung Galaxy S6 and the Galaxy Note 5, the LG V10, and many other handsets. When talking about the Priv, they took it apart piece by piece and then dipped some of the parts into a gold tank. The result is a BlackBerry Priv with 24K gold-plated parts that looks even better than the regular version and has a price to match the new looks as well. Local users can only pay around $355 USD to get the Karalux gold treatment for their Priv handsets, but can also choose the phone and gold-plating for about $1,110 USD. International customers can only get the 24K gold-plated BlackBerry Priv for around $1,500 USD.